Both Hogg and Gonzalez, who refer to themselves as members of the "mass shooting generation," say they've received death threats in response to their efforts in launching the movement. But they aren't letting threats deter them from making progress. "There's always been people who are going to want to harm us," Gonzalez said. "I'm not going to pretend that this like opened my eyes to a cruel and harmful world ... When it comes right down to it, we already knew that this world was going to be tough. So getting death threats like that doesn't really faze us." Asked about the NRA's response to their movement, Hogg responded: "I think it just goes to prove what exactly they are. I don't think NRA members are bad people at all. I think they're responsible gun owners that want to become politically active and make their voices heard in this democracy, and I think that's an excellent thing. "I think the problem comes in when it's people at the top of this organization that don't listen to their constituents and continue to scare people into buying more guns, creating more violence, so they can scare more people and sell more guns," he continued. "The people at the top of the NRA are no longer working for the people that are in their organization. They're working on behalf of the gun lobby." Parkland shooting survivors on activism: "We’re what every American should be"
"The way that they've been reaching out to us is basically threatening us," Hogg said. "They've been instigating things," Gonzalez added. "And then, when we reply, they like shy back away. They can dish it out but they can't take it." "I think this is our way of coping," he said. "Working together and being around our friends in such a time of horrible tragedy and suffering, and making sure that nobody else has to go through this suffering, at least try to make sure that they don't, is our way of coping -- to ensure the safety and future of many Americans. But the fact that 3,000 people, essentially the equivalent of our entire school body, has died since the time of our shooting as result of gun violence is a testament to the serious issue that we have in this country." Meanwhile, nearly 500,000 people are preparing to march on the nation's capital this weekend in support of gun control and school safety measures. Many of those marching will be students. The event follows last week's nationwide walkout, when students from nearly 3,000 schools walked out of their classrooms for 17 minutes in memory of the 17 victims. During a conversation on "CBS This Morning," Hogg said his message to other high school students is: "Make sure you get out and vote, that you're registered to vote so you can vote in the primaries and stay educated for the rest of your life because the seeds of corruption are always being showed." 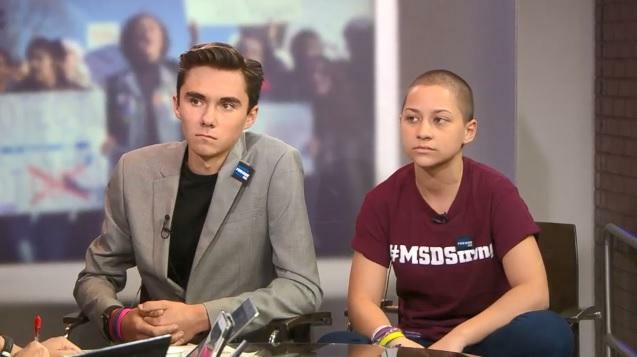 Gonzalez and Hogg are among the student activists featured in the documentary "39 Days," which airs on CBS Saturday, March 24 at 9 p.m./8 p.m. CT.